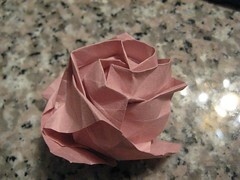 neko_san once showed me a whole paper bag filled with origami roses. Beautiful things. 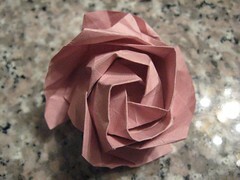 And she told me about the book she'd learned the model from: Roses, Origami, and Math by Toshikazu Kawasaki. I got it for Christmas. And I've tried it out, both the bud and the full-blown flower head. I guess my visual/mathematical brain wanted a little bit of a workout taking things from the 2-D representations in the book to 3-D models. And I have to admit that I think the instructions lacked a certain something. *laughs* But I got it, so... can't say too much bad about 'em. I don't think those look bad at all. The bud is very pretty, actually, and...well, I guess it takes someone with no talent at origami to love everything origami. Good job! Oh, that is pretty. 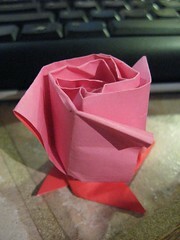 I ought to try origami one day. They're pretty! I've never tried origami but I can appreciate the skill involved. cool! i particularly the photo from above because the shadows reveal and emphasise the folded shapes of the rose petal structure very well. *smiles* Yeah... I think that's my favorite photo, too... especially since with the side one I can see a mistake where I didn't tuck something in right. *laughs*! !